Tree removal is one of the biggest requests from the Staunton, Virginia and Augusta County community. This is because we do have quite a large number of older trees around that should have been taken down years ago. However, at Staunton Tree Service, we do take care of your trees, because that is what we are trained to do. We see trees as gorgeous living things, but we also know that if they are allowed to stand when they are no longer healthy, they can be dangerous. By using a professional arborist and our team, you know that your tree will be quickly and safely removed from your yard. Sure, it can be a complex job, but when done with the proper tools, it can be quite quick. However, it is imperative that you work with a team that is trained, has proper equipment, and is insured. That’s us. Give us a call today and we can get started. Use the form below to request a free estimate on your Tree Removal needs in the Staunton, VA area. Trees have to be removed for all sorts of reasons: they have died, they are too damaged, they are dying, they put your home in danger, they are diseased, and many other countless reasons. Some people get them removed simply because they are unsightly or they want something else to go there. Problematic trees won’t only cause a problem where they stand, but the issue could spread to the rest of your yard as well. Our certified arborists will help ensure that doesn’t happen. If you have trees that are causing your problems, or even ones that you just expect to be problematic, contact us today and we will give you a free estimate for how much removal will cost. Your first step toward getting your tree removed from your property is to give us a call. We will then come to your home and evaluate the job. Then we can give you an estimate for about how much it will cost. Our prices will depend on a lot of different things, including the scope of the project and the tools we will need to use. You can even turn your tree into firewood or mulch, depending on the type. Once your tree is down, we can remove the stump as well so that it doesn’t cause any other problems. Your trees are a part of your daily life, so we know why it might be difficult to get rid of them. However, when they can put you in danger, then it is time to get them removed. 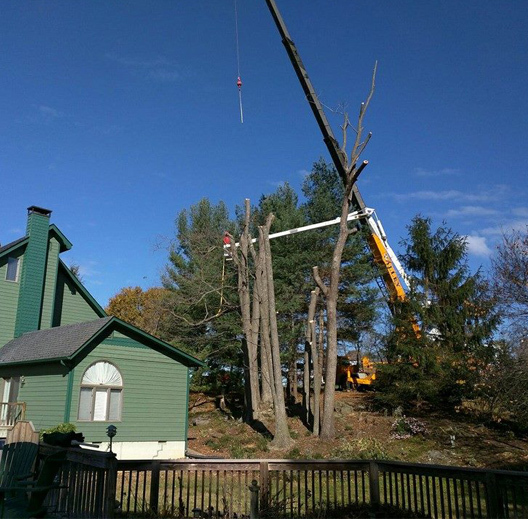 At Staunton Tree Service, we have ISA certified arborists and we are constantly getting new training and working with our equipment to make removal quick and easy. Trees are important and they deserve to live in dignity. However, when trees pose a risk to you and your home, then it is time to bring them down.